One of the strangest bands I ever got into was a Canadian... er... rock... band called Billy Talent. The band scored a minor hit on their debut album with a song called "Try Honesty." On their second album, they really seemed to come into their own. Billy Talent's shtick basically consists of rhythmically interesting, harmonically dense rock riffs combined with truly awful, borderline cartoonish vocals. The vocals aren't just bad, they're idiosyncratically bad. That is to say, you're not supposed to believe the vocals are good. Like a punk band, Billy Talent wants their vocals to be seen as, uh... well unorthodox. Add to that their lead singer's baffling public persona, which can only be described as that of a manic adolescent. He never appears to be serious; or, if he is serious, then he is probably insane or possibly heavily medicated. If you can get over all this, then what you're left with is a rather interesting band. The guitar riffs, the guitar-bass interaction, the melodies, and the harmonies, are all rather elegantly composed and arranged. Guitarist Ian D'Sa has a knack for finding "wrong" chords that sound right. His tones are rather unique, owing to a set of single coil pickups distorted to the extreme. To their credit, they can pull off all the complex tones and arrangements live. However bizarre the vocals might sound on the recording, they can do it live, too. So they sound exactly the way they want to sound. On Billy Talent II, the production value of the album is truly stunning. This fact is generally credited to producer Gavin Brown, who has produced some of the biggest Canadian rock records of the last 20 years. The guitar tones are particularly rich, albeit very heavily compressed. The songs are short, and to the point. Lyrically, the subject matter deals with classic leftist hobby horses such as sexual assaults committed by Catholic priests and communism. No, I'm not kidding about the communism. Two songs in particular, "Red Flag" and "Worker Bees," are overt communist anthems. At this point in the review, I feel like I haven't really done the music justice. The songs are genuinely good, and Billy Talent's sound is truly original - that's what I love about them. But halfway into Billy Talent II, the listener finds himself simply exhausted by it all. The vocals are difficult to enjoy on a musical level. That is, I can see how a teenager circa-2006 could get into it as part of a particular "scene," but now ten years later it sounds like The Muppets - and not in a good way. By contrast, the album's instrumentation is almost gorgeous and anticipates many of the developments that would follow in the more progressive djent metal scene. Billy Talent, though, was more punk rock than metal, so the fact that they were working themselves toward this territory proves that they were visionaries, ahead of their time. If only listeners enjoyed being yelled at for an hour. Weirdly - and I can't really explain this - Billy Talent II reminds me of Megadeth's Youthanasia album. Maybe it's because both albums feature homogeneous songwriting and over-compressed instruments in a hard rock package. Maybe it's because neither album is as captivating when consumed in toto as any of the individual songs on the album are. Maybe it's just because they both feature songs about molestation. I'm not really sure - but I can tell you that I've always felt this way. 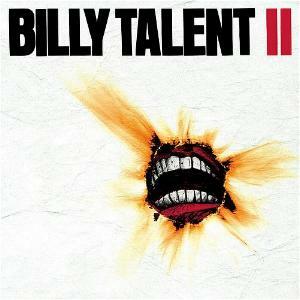 Well, ten years later, Billy Talent II is not an album that sounds very relevant to modern audiences. Listening to it now takes me back in time a bit, but it doesn't make me identify with that period the way listening to an old Soundgarden album takes me back into the grunge season. 2006 was the beginning of the end for the record industry, when all bands were scrambling for top hits, churning out a lot of four-chord hard rock and not a lot of innovation. This album is bound to be yet another at the bottom of the pile. It's worth noting, though, that at the time it was a pretty fantastic album.